It goes like this: two million records, a couple dozen hits, sold-out coliseums across Canada, a Juno Award (Canada's Grammy) for Band of the Year. The Vancouver Sun called them "Canadian rock heroes of the first order ... the best performing band in Canada." If you need reminding, this was Trooper a decade or so ago. And what made them what they were then is still there now: great performances and great pop songwriting. Incredibly, more than one out of every forty Canadians owns a copy of Trooper's 6X Platinum album; "Hot Shots". The band has performed thousands of shows in virtually every city and town in Canada and are the first Canadian band to successfully tour from coast to coast in their home country. In America, they've backed up a who's who of Rock including; Aerosmith, BTO, AC/DC, Steppenwolf, Alice Cooper, ZZ Top, Fleetwood Mac, Jeff Beck, REO, Styx, and many others. 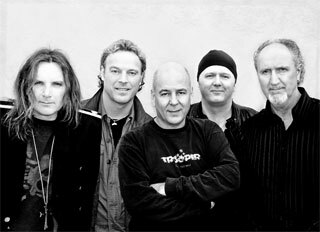 In 1990 Trooper returned to the airwaves with the new album; "The Last of the Gypsies". The welcome afforded them by fans, radio and critics was unqualified. The Toronto Star's Craig MacInnis pronounced Gypsies "a wonderful album, imbued with the humor and verve that only come from slowly digging oneself out of adversity." The album scored Gold-plus sales and new radio hits. Their cross-Canada tour with Helix and Brighton Rock was the most successful Canadian tour of the summer. The video for the hit "Boy With A Beat" received extensive play on Much Music as did a previously unreleased 1980 concert film. The Edmonton Sun hailed the band's return, saying, "They remain, after all this time, real Troopers", citing Ra McGuire's "instantly recognizable voice that's been heard through a million radios in this country ... Trooper demonstrates a vitality that belies its 'relic' status." In 1991 Trooper released their tenth album. The anthemic "American Dream" landed at the top of the charts, as did the heartfelt "Kids in Love". "Ten" was a hit! In early 1995, two vintage Trooper albums were released, for the first time, on CD in Japan. By the end of 1996, MCA Records had decided to acknowledge the band's new-found popularity by re-releasing four more of the groups albums on CD. "Hot Shots" remains MCA's best-selling catalog title. In 1996 & '97, Trooper toured relentlessly, continuing to sell out night clubs, universities and concerts, from Victoria to St. Johns. In 1997, Universal Music (formerly MCA Records) began discussions with the group regarding a 2 disk retrospective containing their 15 hits plus approximately 25 more songs culled from all ten Trooper albums. The set will include unreleased tracks and a twenty-four page booklet documenting the group's career. Throughout '98 Ra and Brian worked on the Compilation Album and gathered together a large collection of Trooper memorabilia that was requested by the National Library of Canada. These items will remain carefully preserved in climate controlled archives. 1997 and '98 saw Trooper attaining Legendary status across Canada - performing at, among other things, the televised 1997 Grey Cup game, the televised '98 West Coast Music Awards and an appearance on the Canadian cult hit TV show: "This Hour Has 22 Minutes" New Years Eve Special. The year 2000 marked the band's 25th anniversary as top performers in the Canadian music industry. With a packed house at Vancouver's Commodore Ballroom, they reunited original group members with the Trooper of today for one incredible and memorable night of celebration. As Trooper continue to sell out shows, large and small, across the country, they often finding fans from three different generations in the audience, proving that the band remains ageless. Trooper has become a Canadian legend - "Canada's number one party band". They perform their huge collection of hits with the vitality and sense of humor that has served them well on their steady march through the hills and valleys of Rock and Roll. Noteable Entertainment & Events is a Vancouver based booking agency, party rental, entertainment services and event production company. If you are interested in booking Trooper please contact us.